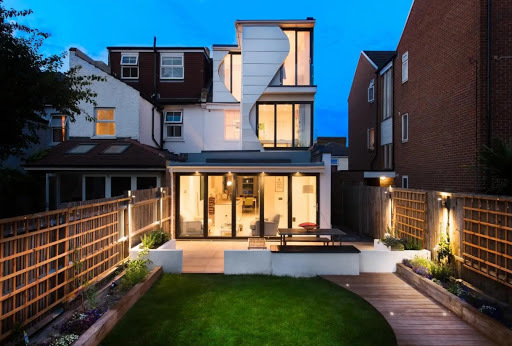 With the UK continuing to blaze a trail in innovative design and architecture, choosing five of the greatest Home Extension projects developed on our very own shores has proved to be an even trickier task than we expected. We’ve gone for five incredible projects which genuinely breathed life into a challenging design brief and helped to shape a bold new chapter in the industry for 2019 and beyond. 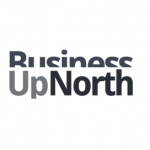 The concept of reverse-living is a growing trend which is really beginning to gather steam throughout the UK and looks set to snowball in popularity in 2019. 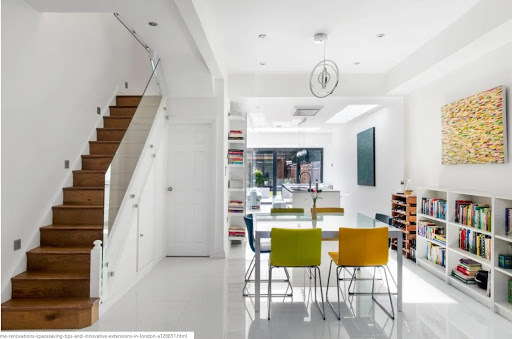 This particular home extension project from Mae House Design is a winning example of how to squeeze every last drop of potential from the idea of flipping your living space on its head. 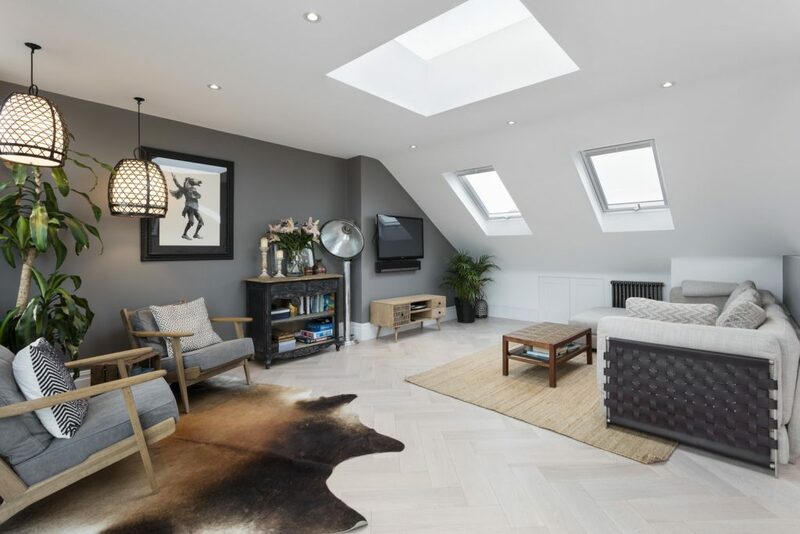 The owners of this double-fronted Victorian flat in Balham commissioned a loft extension which would turn their lives upside down but in a good way. 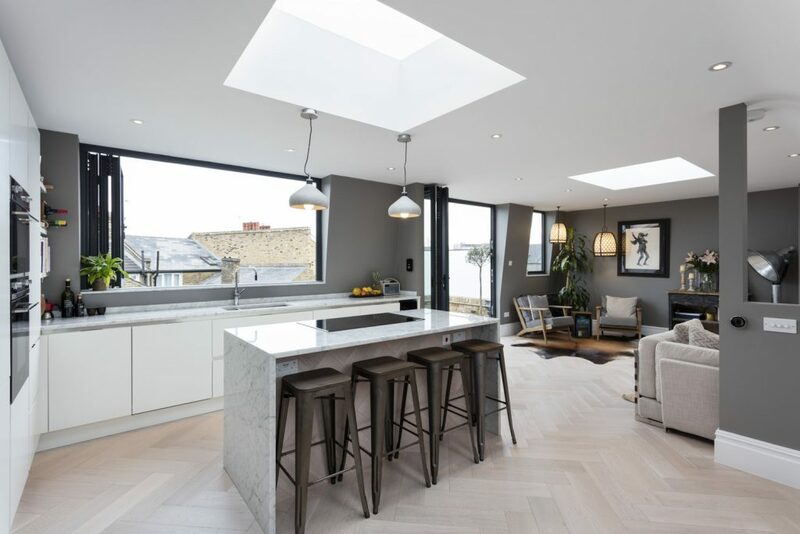 The flat was flipped so that the loft became the new living area – a bright open-plan layout bathed in natural light courtesy of the huge skylights and bi-folding windows. The grey shading of the high-rise living space is perfectly complemented by the white-wash oak parquet flooring, and the whole space is given an extra luxurious finish with touches of marble. Living in the loft has never looked so good. When UK couple John and Caroline Baylis returned from a spell living in Australia, they moved into a South London two-bedroom Victorian cottage. As happy as they were to be back in Blighty, they missed the bright, open, and airy feel of their former home Down Under. They eventually decided to remodel the whole house, and the ambitious project included an attic conversion to create a new large sun-soaked Master Bedroom. But the ground floor extension is the masterstroke of the entire project. The couple waved goodbye to their tiny cramped galley kitchen, and constructed a whole new spacious kitchen area/living room which blends in beautifully with the other new developments to create a deliciously distinctive new look for the whole cottage. In total, the project has added a pretty impressive £900,000 to the value of the property. 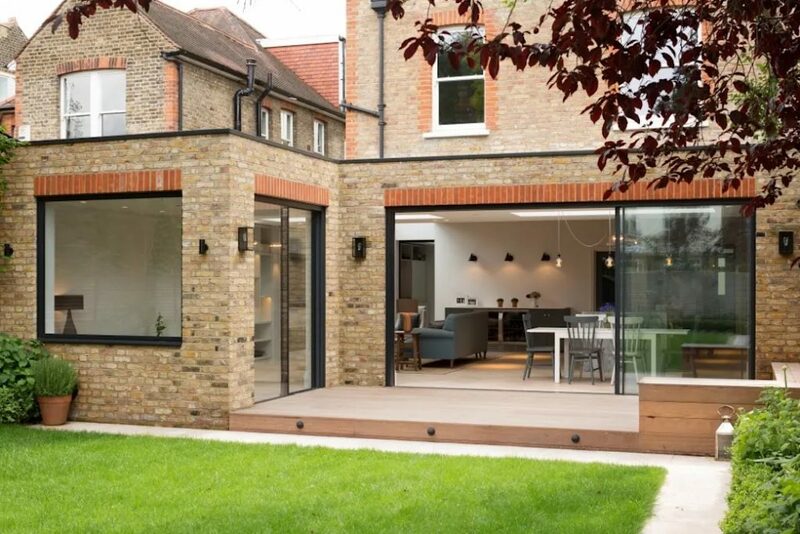 The thing we love most about this single-storey extension to a gorgeous period house in South West London, is how fits in so seamlessly with the original build that it’s almost impossible to tell that it’s a new extension at all. New life was breathed into Pier House in a way that was refreshingly sympathetic to the original design. One of the key elements of the brief was to forge a strong connection between the internal and exterior spaces. Fraher Architects rose to the challenge by creating gorgeous new active spaces and long vistas with framed views. The installation of full height glazing provides a beautiful and practical everyday window into the outside splendour of the property. A stunning project with extraordinary attention to detail. Architects Studio 304 found themselves undertaking the kind of project you don’t come across every day in this industry. A bathroom extension for the ground floor of this Victorian terraced house in East London wasn’t just intended to be a handy new place for a wash and scrub. 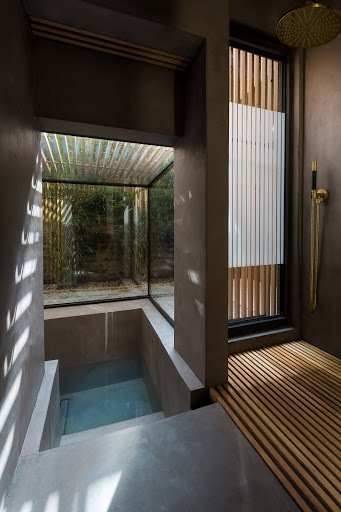 The brief was to create a Japanese-style bathroom to house a sunken bathtub and space to indulge in the relaxing practice of Japanese ritual bathing. Glass walls surround the bathing area, providing views to the bamboo and beautiful plants found in the private garden. Cement-based coating covers the surfaces of the bathroom, while an elegant golden touch is applied to the taps and shower heads for a luxurious finish. The final result is a sight to behold, although the neighbours and passing overhead vehicles won’t get too much of an eyeful, thanks to the larch slats on the glass roof and sides. 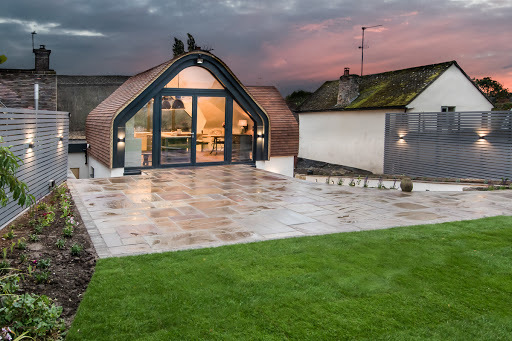 When the owners of a delightful medieval thatched cottage in the conservation area of Long Crendon required a new contemporary extension, Lynn Palmer Architects were called in to handle the incredibly ambitious project. The brief was to create a large new family living space, entrance hall and kitchen/diner, along with new bedrooms and a view of the beautiful 200ft long tiered rear gardens. The Architects were required to work very closely with the local conservation team to ensure that the new extension did not dominate or obscure the original listed building. Another challenge was the fact that the rear gardens are actually level with the underside thatch of the original cottage, far too high up for a typical living room view! The solution was another example of flipping a house extension problem on its head – the living rooms were created on the upper level of the new building, providing stunning views of both the garden and the original cottage through the glass-ended tube design. 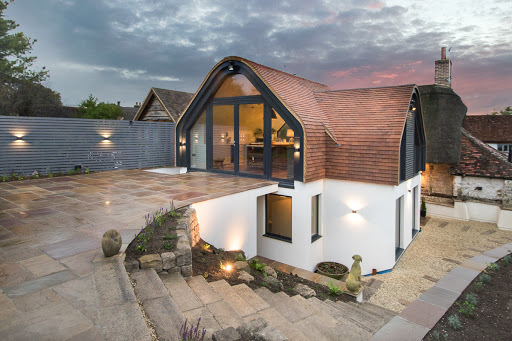 The curvature of the new roof reflects the shape and identity of the cottage, resulting in a truly breathtaking project which should almost have been impossible – a magnificently modern and stylish new addition to a family home which is still very much rooted in the design of the original build.